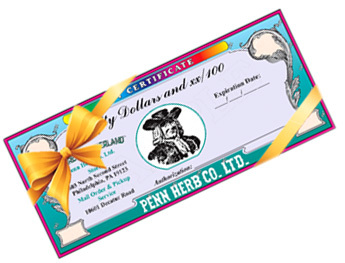 Gift Certificate: $50 - Penn Herb Co. Ltd.
Finding the perfect gift for someone isn’t always easy. Penn Herb has a great selection of herbs and remedies, but sometimes you just can’t find the right gift for that special someone. Or maybe you don’t know what they really need. Whether it’s a present, reward, a gift to celebrate a special occasion, or a simple gesture of appreciation, a Penn Herb Gift Certificate is the perfect present. Certificates are redeemable toward anything at PennHerb.com or in our retail locations. They may be purchased in convenient amounts with no fees. Need a last-minute gift? Your recipient can spend their gift certificate right away with the link you provide them by email. If you prefer, you may print the gift certificate and give it personally, or mail it with your own gift card – it’s your choice. Check your balance anytime by visiting the redemption link. Multiple certificates of different amounts may be purchased on the same order. To purchase multiple certificates of the same amount, please order each one separately. You may email the redemption links, or give a printed certificate. Terms & Conditions: Gift Certificates are valid for one year from date of purchase. They cannot be redeemed for cash. The balance due on an order that exceeds the gift certificate amount must be paid by credit card. Not refundable if lost or stolen. The terms and conditions of this certificate cannot be varied except in those states that prohibit expiration dates or require redemption for cash.